Alfie Stewart (left) at a special celebration dinner to mark Portadown's 1991 league-and-cup double triumph. Alfie Stewart’s stature as a Portadown legend was secured on the principles of professionalism, pride and passion. The centre-back cemented his place in club history as a key cog within a trophy machine assembled by Ronnie McFall. Stewart remains a Ports fan and feels McFall’s decision to step down marks not only the end of an era but what should prove the start of an internal audit into the club’s modern demise. “There is a great sadness attached to Saturday and the question must be asked as to why it reached that point,” said Stewart. “I had fantastic times under Ronnie at both Glentoran and Portadown. 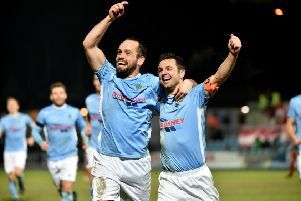 “I owe my success to Ronnie and was able to learn from him just what was required to be an Irish League player. “I cannot complain about his treatment of me as a young pro coming into the game or a senior player in latter years. “He was intolerant of anything other than total professionalism and that is why I cannot equate that with what I have seen develop across recent seasons. “Fitness seems to have been an ongoing issue and a lack of passion on the pitch from certain players. “I do not know why it was allowed to reach that point but the Ronnie from my time as a player would have stamped out any of those problem signs early on. “He was ruthless, fantastically efficient in his decisions and a true winner. “As a player, it was made clear to me that my job after signing for Portadown was to turn up, train hard and put in the performances on the pitch. “Everything else would be handled by Ronnie and he was a fantastic manager for me and someone capable of building more than one successful team. Stewart considers the pursuit of one final prize as the driving force behind McFall’s decision to stay in the Shamrock Park hot-seat. “I developed that passion for lifting trophies as a player and there can be no doubt Ronnie has it,” said Stewart. “It never ends with the first trophy but there comes a time for everyone to realise it is right to call it a day. “I never was able to throw myself into coaching or management because I knew what was needed to go into playing and admire those willing to sustain that commitment after hanging up the boots. “I am sure over the next few days, weeks or months we will hear Ronnie’s view of the whole scenario and his thinking behind that final decision. “Every club in Ireland had that fear of Ronnie coming to call as no player appeared unattainable to him. “However, once the financial clout diminished that obviously made it more difficult but my guess is he was chasing that final trophy. “That drive to prove the doubters wrong maybe left it so he couldn’t draw himself away. “He maybe should have gone that bit earlier and leaving on a high note after lifting a trophy would obviously have been a much more fitting end.